Eurocom Corporation (www.eurocom.com), a developer of long lifespan, fully upgradable Notebooks, high performance Mobile Workstations and Mobile Servers is now supporting the Intel Core i7-3920XM Processor Extreme along with the Intel Core i7-3820QM, Intel Core i7-3720QM and Intel Core i7-3610QM in the Eurocom line of Notebooks including: EUROCOM Neptune 2.0, Racer 2.0 and Monster. 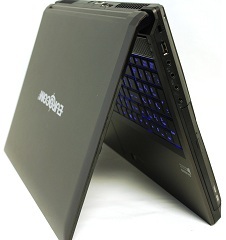 Eurocom’s line of high performance Mobile Workstations and Gaming Notebooks will be bolstered by the introduction of the Intel Ivy Bridge processors and complete line of Intel 22nm processors. The Eurocom notebooks will be some of the world’s first Ivy Bridge notebooks with Intel HM 77 and HM 76 chipsets using the uFPGA988B socket. Eurocom Notebooks are ideal for professionals and teams who frequently travel and need access to high performance computing. Eurocom’s notebooks will support the new line of Intel Ivy bridge processors along with existing Sandy Bridge processors to offer customers the maximum customization options. The Ivy Bridge line of processors is the first to support 3D transistors for increased energy efficiency and performance inside Eurocom notebooks. “Continuing our tradition of innovation, Eurocom is excited to offer these new high performance processors in our new line of notebooks, the Neptune 2.0, Racer 2.0 and Monster 1.0. Our customers will be very pleased with the performance” says Mark Bialic, EUROCOM President. The EUROCOM Neptune 2.0 is a 17.3” Mobile Workstation that utilizes the Intel Mobile HM 77 Express Chipset with support for the full line of 22nm Ivy Bridge Processors. Graphics support comes from new NVIDIA GeForce Kepler GPUs including: 660M, 670M, 675M along with NVIDIA Quadro 5010M, 4000M, 3000M and next generation AMD Radeon GPUs. With support for up to four storage drives where two support SATA 3 technology and the other is a high performance mSATA drive. The Neptune 2.0 supports 32 GB of DDR3-1600 memory for unforeseen multitasking ability and performance. The EUROCOM Racer 2.0 is a 15.6” small form factor Mobile Workstation utilizing the Intel Mobile HM 77 Express Chipset with support for the full line of 22nm Ivy Bridge Processors. Graphics support comes from NVIDIA Kepler GPUs including: 660M, 670M, 675M along with NVIDIA Quadro 5010M, 4000M, 3000M and next generation AMD Radeon GPUs. With support for up to three storage drives where two support SATA 3 technology, where one is a high performance mSATA drive, and the other takes the place of the optical drive. The Racer 2.0 supports 32 GB of DDR3-1600 memory for unforeseen multitasking ability and performance in a 15.6” system. The most powerful 11.6” system on the planet, the EUROCOM Monster utilizes the Intel Mobile HM 76 Express Chipset with support for the full line of 22nm Ivy Bridge Processors. With graphics performance coming from an NVIDIA GeForce GT 650M graphics processor, the EUROCOM Monster is the ultimate ultra mobile gaming system. The EUROCOM Monster 1.0 supports up to 16GB of Dual Channel DDR3-1600 memory via two channels and weighs in at a very light 1.8 kg.